This is one of my favorite scrapbook pages- not because I think it's any kind of genius layout or anything, but because I just love the pictures. It's easy with all the embellishments and fancy designs to forget that that the purpose of a scrapbook is to showcase your PHOTOS. Most of us scrapbook for ourselves- to have a beautiful reminder of the moments in our life that we treasure. 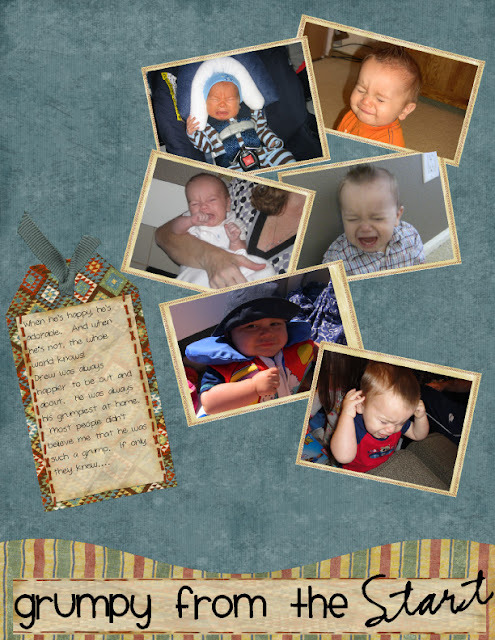 I can't say I "treasure" the screaming grumpiness portrayed in these pictures, but I will always remember the challenges I went through with this difficult baby. It made me closer to him and more appreciative of the good moments. How do you keep your treasured moments in your memory? Do you journal? Blog about them? Scrapbook? I'd love to know.